The Orange San Francisco pops up as the first Android own-branded device from Orange. The San Francisco is an Android-toting handset that's pitched at the lower end of the market. At £99 on pay as you go, it's comparable with handsets like the ZTE Racer, Vodafone 845, and T-Mobile Pulse Mini. All these lower-cost Android handsets are obviously compromised in comparison with their high-end counterparts. The real questions aren't how they stand up to all other Android phones, but how they stand up to each other and to other £100-ish mobiles. With Android 2.1, Wi-Fi, GPS, and 3G in the mix, the feature set is compelling, and the 3.5-inch 480 x 800 pixel touch screen suggests great things in terms of visuals. For a budget handset, the build is lovely. The chassis feels very solid, its slate grey main colour is appealing, and the sliver highlights on the long edges look reasonably cool too, though of course they're plastic and not metal. The Orange San Francisco is fairly thin at 11.8mm, and narrow at 56.5mm, while its height of 116mm is average. If we were being fussy we'd say that the weight is a bit on the heavy side at 130g, but it's not a big deal. Overall the Orange San Francisco feels quite comfortable to hold and is easy to pocket. There's a row of very small buttons under the screen providing the Android Home, Menu and Back functions. If you want search you can slap the Google search box widget on the Home screen. A 3.5mm headset connector sits on the top edge along with a teeny on/off button, while the left edge houses a mini-USB connector and the right a pair of volume buttons. Minimal, yes, but that's all you need really given that the touchscreen is available for anything you must have immediately to hand. So, we're in Android 2.1 land, which means multiple Home screens and widgets. But we're also in Orange land, which means Orange skinning, Orange apps and some Orange-specific widgets. There are five Home screens, and you sweep between them with your finger as usual. A press of the Home button takes you to the central Home screen. Each of the Home screens has a fixed set of four icons along the bottom, which give you access to the full apps menu, messaging, the dialler and contacts. Interestingly, when you flick a Home screen into wide format the four fixed position shortcuts sit themselves in vertical alignment down the right hand side of the screen. There are some nifty widgets that Orange has tweaked. The Messages one, for example, displays incoming messages that you've not read and has little 'Read' and 'Compose' shortcuts so you can deal with stuff quickly. Meanwhile the photo viewer widget gives you large thumbnails of images, a scroller, and the ability to quickly share images, edit them, and jump to the camera. In fact, there are quite a lot of Orange widgets to choose from to help bulk out the Android ones. If only Orange had a nicer native colour scheme on the widget picker than its orange and grey one, though. Incidentally, if you don't like the overall look of Orange's default Home screen style you can run the Homescreen Selector app and choose the alternative – good old totally unskinned Android. It's worth making a comment about the screen at this point. It measures 3.5 inches across diagonal corners and it does feel quite sizeable considering the small overall handset size. It is capacitive and responds well to finger presses. Generally we found it to be sharp and bright – remarkably so, for such a low cost handset. It's a real highlight of the phone. There are no Call and End hardware buttons on the Orange San Francisco, and we're perfectly happy for that to be the case. They aren't necessary, since a quick tap of the dialler button on any of the Home screens calls up the dialler from which you can, quite simply, launch into a call. Many Android handsets have the ability to grab contacts from a range of third-party apps, most often the likes of Facebook, Twitter and MySpace. Not here, though. The import options are from your Google account, an SD card or your SIM. There's also the old fashioned way via your PC if you download HTC's PC Sync software. You can create contacts on the handset too, of course, and that's just a matter of running through the new contact screen to add what data you want. You can do the Facebook and Twitter things but oddly Orange has not bothered to install apps for either on the handset, so you'll have to pop into the Android market and make a couple of downloads to get you started. Not a problem, since there are some great free apps, just an irritation. We didn't have any problems with actually making calls, holding a signal or with call quality either – the San Francisco acquitted itself well as a handset for that good old fashioned thing: the voice call. When it comes to messaging, like we said just a moment ago, Twitter and Facebook fans will need to download apps to take advantage. Still, you've got mobile email here, and when it comes to setting that up Orange offers plenty of options that should help you get things done faster. 'Work' is a shortcut to helping you set up your Exchange email system, while the others are services that are pre-populated with some of the information you need. The list is just a little longer than this screen shot suggests. If your email provider isn't on the list, then you'll need to get the POP and SMTP details from them to set up mobile email. It's not a big ask, though. Whether you're creating emails or SMS, you'll be using the on-screen keyboard. Well, one of two, actually. The standard Android keyboard is here, and you also get the TouchPal keyboard which gives you a couple of different layouts including a 12-key phonepad and one that puts two characters on each key. Working in tall format is a little cramped whichever keyboard style you choose, because the screen is on the narrow side. But flick into widescreen mode and there's plenty of space for two-thumbed typing at speed. 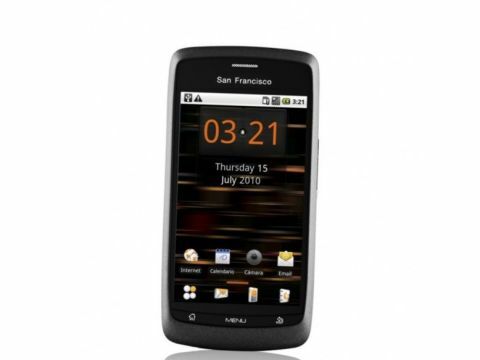 The Orange San Francisco is a 3G handset and it loads web pages reasonably quickly. We mentioned earlier that the screen measures 3.5 inches and has 480 x 800 pixels. It's sharp and bright, and quite well suited to web browsing. Pinch to zoom works well and is responsive, and you've got a rather nice 'share pages' feature, which means you can send someone an email or text with a direct link to a web page really easily. The Orange San Francisco has a 3.2-megapixel camera that shoots a reasonable picture. It has autofocus, which is a nice plus point, but not having a flash is a downer. Video is probably best left alone, though and is quite possibly the most disappointing aspect of the San Francisco. There aren't a great many settings and bits to fiddle with in the camera, but what there are you can pull out from a left-side menu. Video is probably best left alone unless you have no scruples about quality. The videos we shot tended to be jerky despite our own smooth movement of the Orange San Francisco, and to show the same lack of ability to cope with lighting conditions as the camera. The music player on the Orange San Francisco is the standard Android one. Sound volume isn't very loud when at its maximum through the loudspeaker, and it's a little heavy on the treble and lacking in bass tones. The headphones Orange provides aren't up to much, but they do have an inline pause/play control, which is something we're pleased to see on such a low cost handset. Using a set of our own earphones improved things dramatically. The 3.5mm headset connector is on the top of the chassis, which is precisely the right place for it. There's an FM radio on-board but it's not particularly user friendly. There doesn't seem to be a way of playing music through the loudspeaker for a start, and you can't autoscan channels. The best you can do on that front is to seek and then save each channel individually. There's no RDS and no way to name channels manually. The saving grace is a sleep timer. Video playback is handled by a separate app and the screen's high resolution helps with quality. This time the loudspeaker works too, thank goodness! You've also got access to Orange TV, which is one of the apps Orange has peppered onto the handset. We found the streaming to be perfectly acceptable, though it's not live TV that you get but news, pop videos, movie trailers and other snippety stuff. With a 1250mAh battery on-board, the Orange San Francisco isn't going to last you several days between charges. Gauging battery life is always a bit of a tricky thing to do, because depletion will depend on how heavily you use particularly power draining aspects of the handset. We got through a day's pretty heavy usage with some juice left in the tank, but we'd expect to be charging every day. When it comes to apps, there's quite a lot here in addition to the Android staple fare. The GPS is used by Google Maps and also by Orange Maps which is Orange's own sat-nav tool. We found the GPS was pretty efficient at getting and retaining a signal, and having two mapping options to hand means you can choose which you like best right out of the box. Orange adds its own App Shop for games, apps and ringtones. It doesn't work over Wi-Fi, but you may find it a useful companion to the application-filled Android Market. Orange has filled the phone with its own apps, as you'd (sadly) expect, with the Orange Wednesdays app for Android (two for one deals on cinema ticket) the headliner. And there's a little weather app that does what its name suggests. There is also a version of Documents to Go for viewing Word, Excel, PowerPoint and PDF files. The Orange San Francisco impressed us a lot more than we expected it to. There is quite an array of Android handsets lurking around the £100 mark, and this one is the pick of the bunch. It has Android 2.1 which might mean an upgrade to 2.2 could be close, and its high-resolution capacitive screen puts it streets ahead of competition like the ZTE Racer, Vodafone 845, and T-Mobile Pulse Miniin terms of usability. The build quality also punches somewhat above its weight, and while we can't really forgive the somewhat lacklustre camera and poorly featured FM radio, it's a small price to pay for what are, generally, some pretty neat features. Even the provision of a 2GB microSD card to boost the 150MB of internal memory is a pleasure to see. Oh, there's something we've not mentioned thus far and we think we'll just drop it in here. The Orange San Francisco is made by ZTE. And we like it more than we liked the ZTE Racer. TechRadar aims to produce the most helpful phone reviews on the web, so you're able to make a more informed buying decision. Part of this testing process includes benchmarking. It's a good way of measuring the overall performance of a product's internal hardware components. We use Antutu System Benchmark to test tablets. It's a comprehensive Android benchmarking app and produces consistent results. Antutu measures an Android device's CPU performance, 2D and 3D graphics performance, memory speed and internal and external storage read/write speeds. It combines the results for each test and gives the device a final score. We test each device three times and take an average. There are some budget Android handsets that we think let Android down. They don't show off the operating system in a good light and could easily turn people away because of that. The Orange San Francisco is a different kettle of fish. Yes, it has a 600MHz CPU, which is far from the fastest, but it didn't falter at the first hurdle, coped well with video playback and only really stumbled when we asked it to do a lot of stuff at once. Yes, the Orange San Francisco is light on internal storage, the camera is ropey, the FM radio ditto. But Orange has come up trumps where it really matters, with good build quality and an excellent screen considering the price of this handset. With those factors in mind we think it would be a great intro to Android for the more cash-strapped among us. Smashing screen. Capacitive with pinch to zoom support and a good resolution at 480 x 800 pixels. And at 3.5 inches it's large enough for web browsing. It's got nice build quality featuring a sturdy fascia with a pleasing visual design, but without flashy buttons all over the place. It also has some nice Orange widgets that seem to have been well thought through. You can ditch the Orange Home screen design and go right back to plain vanilla Android if you'd rather. Orange bundles a 2GB microSD card. Not huge, we know, but on a budget handset the pennies really count for Orange as much as for the purchaser, and it's a nice little plus point. Even though the headphones are a bit ropey, we like the inline pause/play button they sport. No integrated Facebook or Twitter clients. Not a disaster, since you can download them from the Android Market easily enough, but we'd have liked to see them on-board out of the box. The camera needs a flash and, well, to be better all round really, and the video camera really needs a kick up the, er, specifications. The FM radio leaves a lot to be desired in terms of usability – perhaps not the phone to be getting if listening to commentary at football matches is paramount. Every operator has its budget Android offering and you can also get several SIM free. The Orange San Francisco is the best of the bunch because Orange seems to have got the bottom line features right. Good, large, high-resolution screen, nice solid hardware design, neat array of Orange widgets, a processor that doesn't get challenged till you start to thrash it. Thumbs up!